Anna & Dede have been friends since they were children having both grown up in the Oak Grove/Sagamore Hills communities. Anna graduated from Lakeside High School and has a BSW from The University of Georgia. and worked as a social worker for several years before opening a folk art gallery, Yellow Dog, in Oakhurst with her husband. After several years Anna and Thomas decided to close their shop and focus on raising a family. She has two girls, Ramona & Corinne, who go to Fernbank Elemetary School. Dede graduated from Woodward Academy and studied painting, drawing and graphic design at The Universtiy of Georgia and has a degree in Advertising. 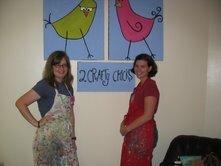 After college they both began working at the Oak Grove Young Children’s School where they reconnected while teaching three and four year olds and found a similar passion for art and teaching. For several years they taught art camps and classes at various community centers and schools when finally, in 2005, they decided to build their own busiess and open an acutal studio. They both have a shared love for glitter, making new things out of paper plates and trying new stuff! Directions: We are located directly across from the Emory Clairmont Campus entrance. 1549 is a brown, brick office building. 2 Crafty Chicks is on the back of the building on the first floor.